The Renaissance Artist of Parma. Antonio Allegri more commonly known as Correggio was born in this northern Italian town in 1489. It is not known how much influence ( if any) other major artists from Rome or Venice had on his work. He was influenced by Mantegna's work in Mantua but, according to the great art historian Vasari, he never visited Rome. Details of his life are sparse but his major works were executed in Parma a world away from his southern contemporaries. We know that he married a lady from his hometown, Girolama Francesca di Braghetis, and had at least one son, Pomponio Allegri, who was also a painter. His first major commission was in 1519 for the convent of St Paul, the Camera di San Paolo in Parma. He painted a scene of marble images and playful cherubs and also an image of Diana. His next work was the Vision of St. John on Patmos (1520-21) painted for the dome of the church of San Giovanni Evangelista in Parma. 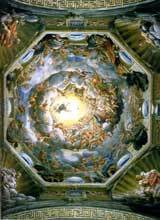 Between 1526-1530 he decorated the dome of Parma Cathedral with his great masterpiece The Assumption of the Virgin. The painting is crowded with figures receding upwards and gives the illusion of an open sky as the Virgin ascends into heaven. 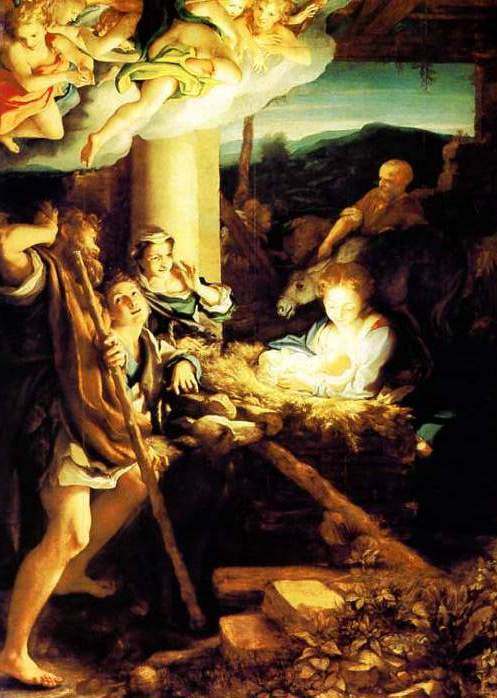 Possibly his most famous painting is The Holy Night. Ganymede Abducted by the Eagle. Ganymede Abducted by the Eagle, 1531, is one of a series of works by the artist depicting the Loves of Jupiter from Ovid's Metamorphoses. Commissioned by Federico II Gonzaga of Mantua, these paintings are in stark contrast to his religious works. Jupiter and Io, also from 1531, is now housed in the Kunsthistorisches Museum of Vienna. This is yet another commission from Federico II Gonzaga and forms part of the series from the loves of Jupiter. It is now housed in the Galleria Borghese in Rome. Correggio died on March 4, 1534.